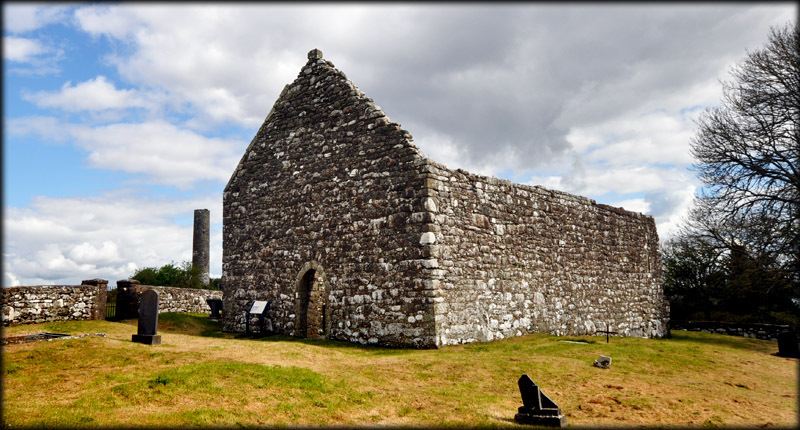 This early 13th century church is the largest and also the latest church remaining on the island. It has a slightly pointed gothic type west doorway. There is a 17th century box tomb located in the altar area below the main window in the east wall. At some time it was removed from here to a church in Whitegate to be used as an Altar, but was returned to the island in 1880. 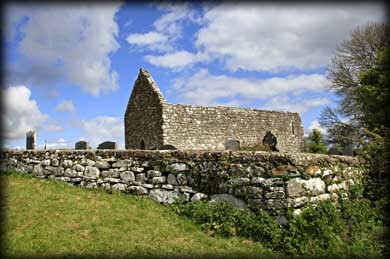 It originally stood under the tomb canopy built into the south wall. Built against the outside of the north wall is a curious structure with a channel built into it. There are several theories about its purpose, a lepers squint or hagioscope is one suggestion and a defensive feature is another. Pictured above are some of the cross slabs that are lined up against the interior of the north wall. The image far right shows the figure carving at the top of the canopy on the south wall. From here we made our way to the bargaining stone. Discovery Map 58: R 6978 8491. Last visit April 2012.